Simple is an office chair that works in many environments, depending on the options chosen. 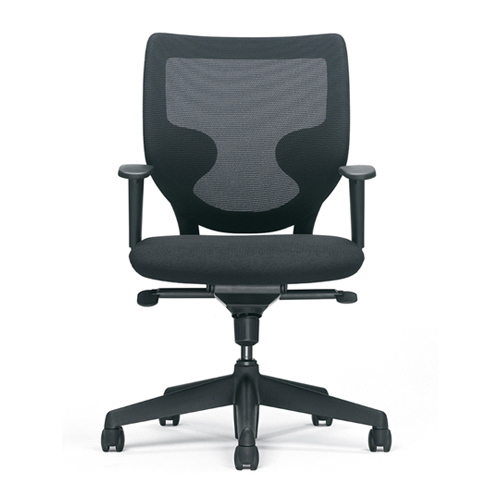 At its simplest, it is a swivel-only, fixed height, conference chair with fixed arms. Choose pneumatic height adjustment and adjustable arms, and it is a desk chair. With the optional Knee-Tilt mechanism and adjustable arms (upcharges apply), it becomes a fully ergonomic task chair. Simple's spring steel frame provides innate flexibility and the naturally elastic knit mesh back is engineered to provide lumbar support. The seat is always upholstered, and the back can also be upholstered, if desired. A companion sled-base side chair and stool version are also available.